Social Media has acquired immense popularity in recent past. The increased popularity has created a hype portraying social media as a solution to all the business problems and issues. There is a difference between ‘most’ and ‘all’ that businesses need to realize. The focus has shifted from developing an effective strategy to simply using social media to reach out to the audience. 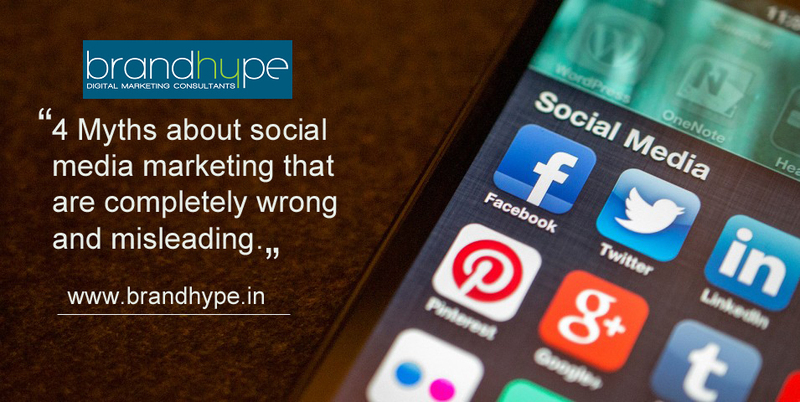 It is now time to bust some myths related to social media marketing. These myths are not only wrong but also misleading. In the modern entrepreneurial world, social media has a very crucial role to play. Hence it is important to understand its nuances and put the hard work in the right direction. Social media is a sales tool: No. Social Media is a brand building tool. Sales are just a by-product of an effective branding strategy. When fixing your objectives for a digital campaign, be precise and clear. Explain your social media marketing agency that your focus is on creating brand awareness. Though there are some innovative sales tools available, they are a just a support to your sales strategy. These tools cannot drive sales in isolation. Going social is an independent strategy: Entrepreneurs think of social media as “just another thing to do”. It’s not. It is as important as strategizing a television ad or a print campaign. You cannot rely solely on social media to achieve your objectives. It has to be clubbed with SEO and web analytics to have a complete social media marketing strategy. Social Media will impact your web traffic, online reputation, search engine optimization, customer grievance management and also brand reputation. Social media is free, so I can use it the way I want to: You do not need to pay to register or start a page. But to make the best use of the benefits of social media, expenses are involved. Also, thinking of social media as a free tool, you are likely to value it less. Social media may be considered as an investment of time and effort. Thinking of it as an investment, you will look for new ways to get maximum value. Viral posts on social media can be made for free but requires time and effort. You have to ‘understand’ social media to make it large: A lot of veteran entrepreneurs think of social media as a Young Thing. You do not need to be young or a master of social media to use it for your business’ benefits. Hiring a social media-marketing agency can do the trick for you. You can concentrate on business development while the agency continues to grow your social media accounts and brand reputation, says Arvind Malick CEO of brandhype, a reputed digital marketing agency in Delhi. The innovative techniques and dynamic work culture we follow help enterprises beat their competition in style. Active social media presence is surely a necessity for enterprises in the modern world. Hence, it is important to bust these myths and put efforts in the right direction.